Ein Zivan kibbutz presents itself as the perfect retreat for Israeli families who want some time away from the heat and buzz of cities like Tel Aviv; it is green, quiet and benefits from the cooler, more comfortable climate. 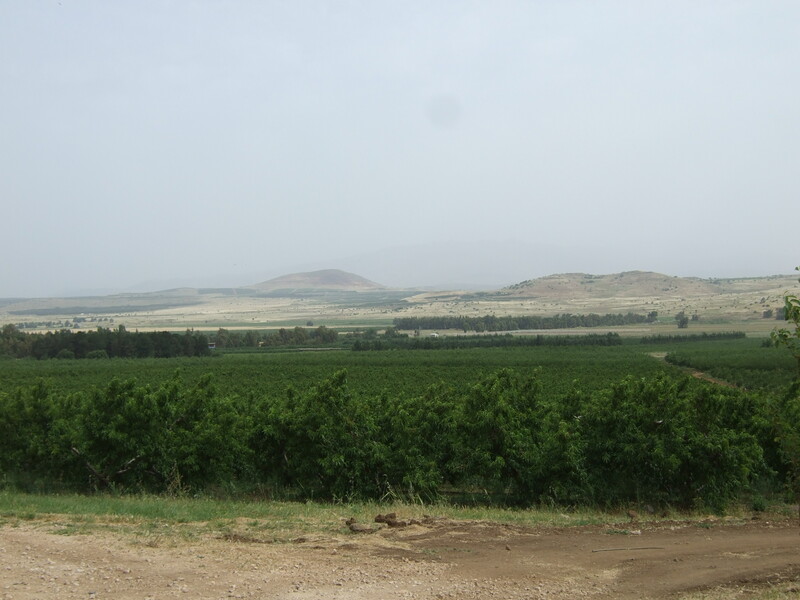 It was also one of the first settlements in the Israeli occupied Golan. 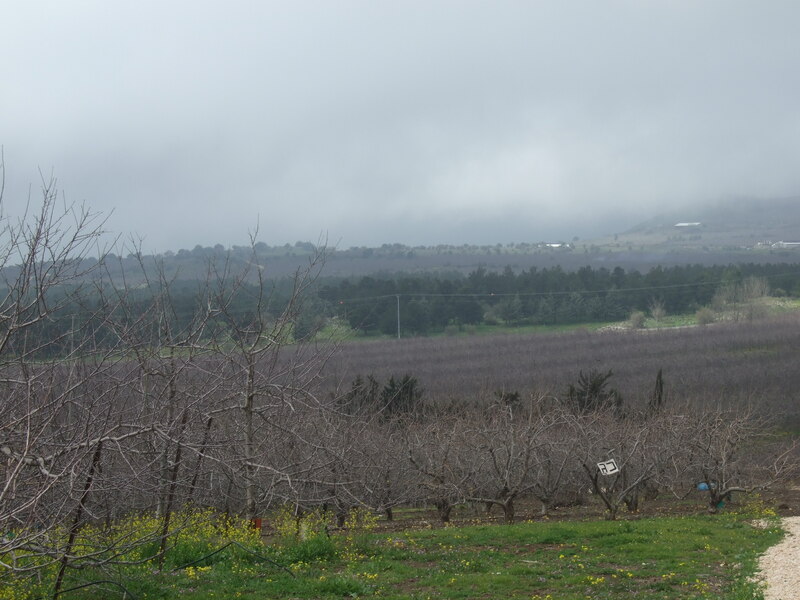 Established in 1968, it has a population of around 50 Israeli families and -like most Golan settlements- makes its money through tourism and fruit sales. Cherries, blackberries, strawberries, peaches, pomegranates, plums, apples and various herbs are all grown on the land occupied by Ein Zivan. 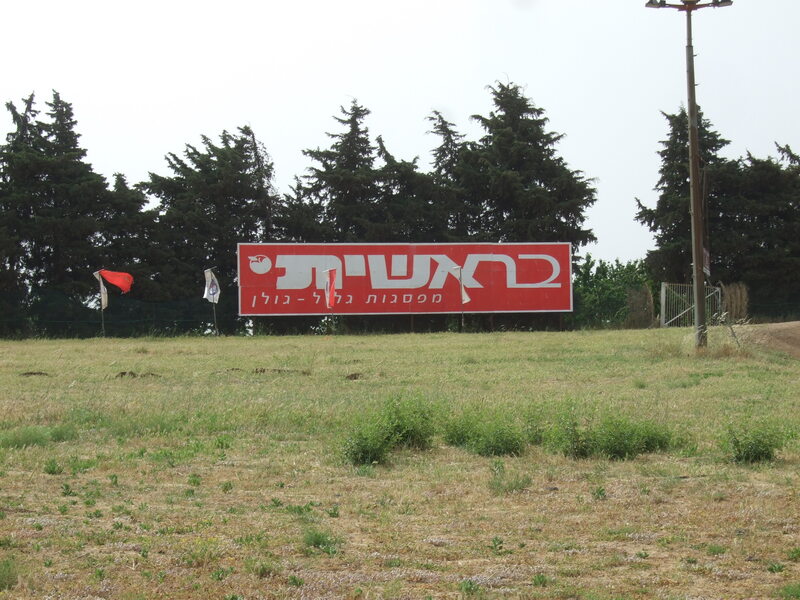 The kibbutz runs a popular ‘pick your own fruit’ service for tourists and locals, but its fields are covered in flags and signs for the Israeli fruit export and marketing company Beresheet, who clearly run the distribution part of their business (for a previous Corporate Watch article about Beresheet see https://corporateoccupation.wordpress.com/2010/04/22/beresheet-exporting-the-fruits-of-occupation/ ). 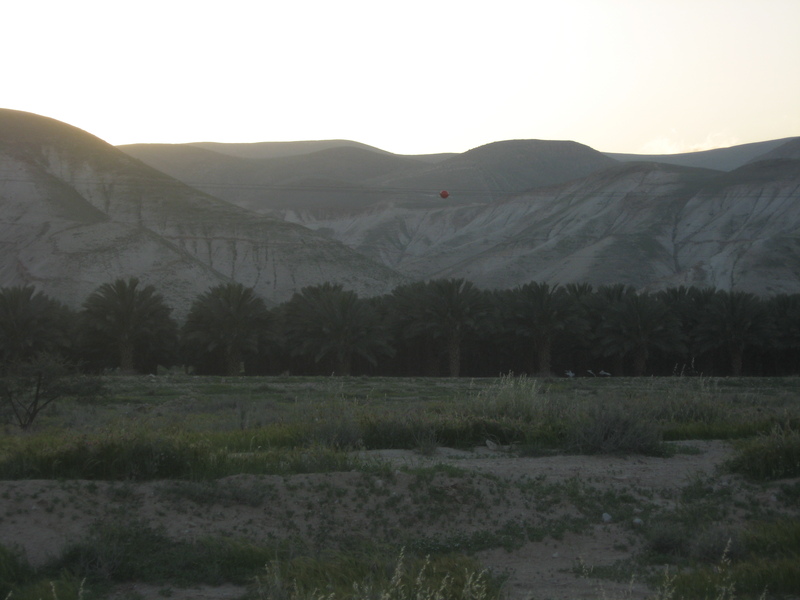 Argaman is a Jordan Valley settlement off route 90, the road running North from Jericho, through the valley to the Galilee. It was established in 1968 on land seized by military order after the occupation and forced expulsions of 1967. The building was done under the auspices of the World Zionist Organisation. The settlement spans almost 9500 dunums and houses around 175 Israeli settlers in a fenced residential settlement. The majority of Argaman is reserved for its agricultural area. 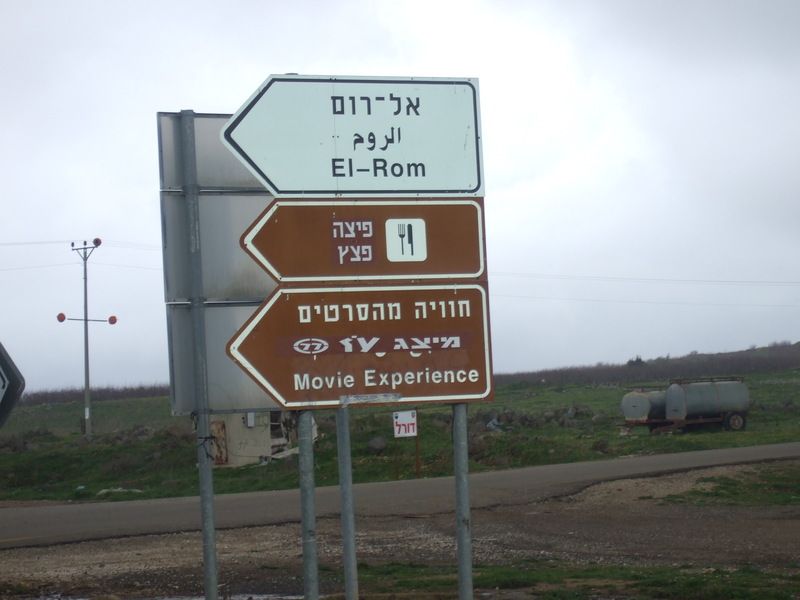 Fittingly, the settlement is named after two soldiers who died during Israel’s brutal conquest of the valley. 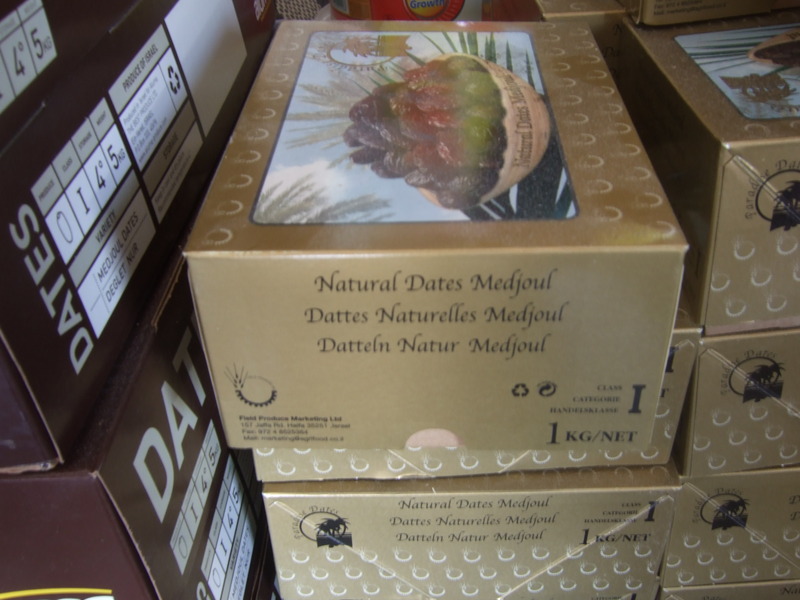 A South African fruit grower is selling dates to an Israeli settler company. 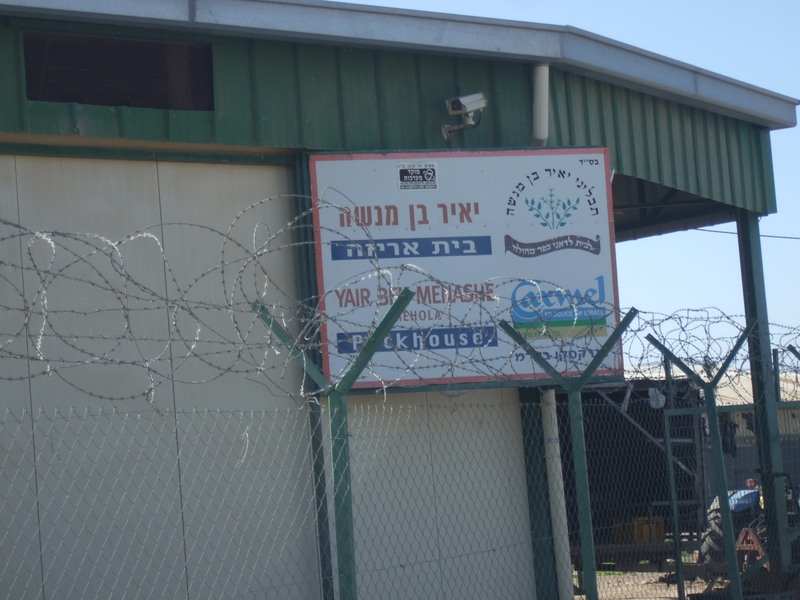 As part of Corporate Watch’s efforts to map settlement exports from the Jordan Valley, we visited the illegal Israeli settlement of Ro’i earlier this year. 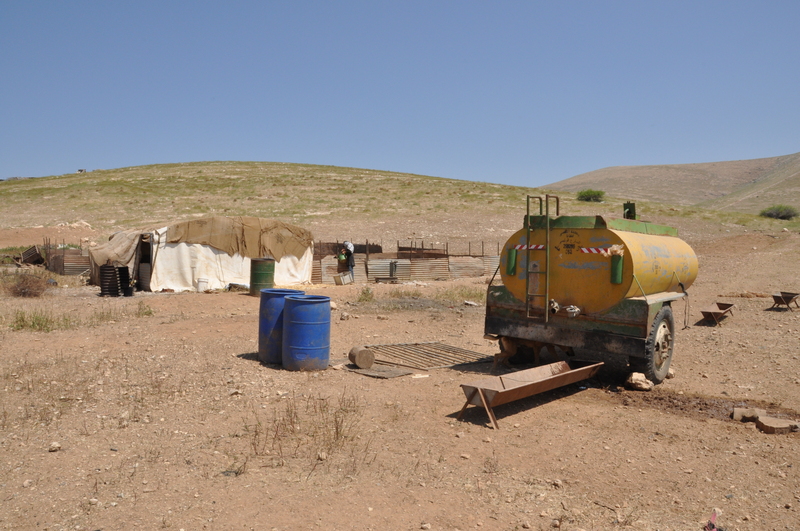 Established in 1976, Ro’i is a “typical” Jordan Valley settlement in that it has a low population (of less than 150 settlers), but has stolen large areas of land from the indigenous Palestinian population. 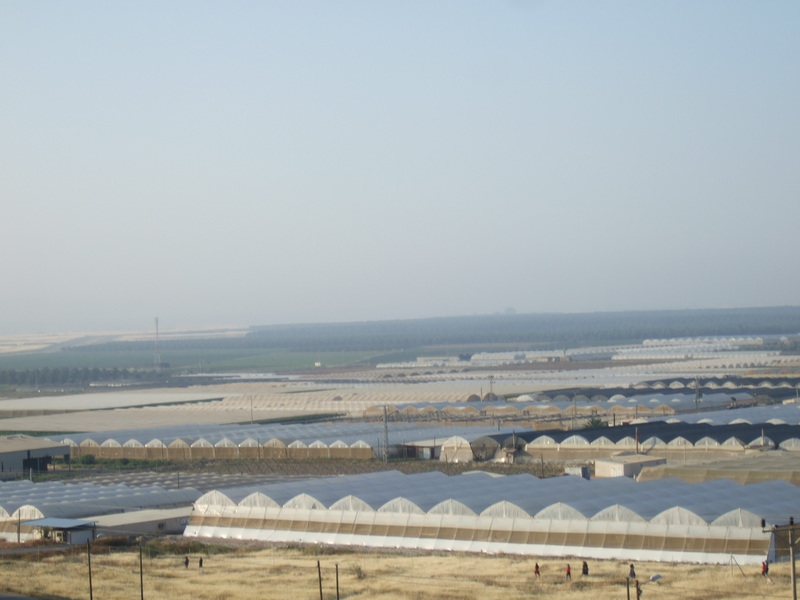 With its private security, army protection and rows upon rows of greenhouses, Ro’i poses a challenge to the existence of Bedouin communities such as nearby Al Hadidya and Ras-Al Ahmar, who are under constant threat of house demolitions and army harassment aimed at the ethnic cleansing of bedouin from the area. The Israeli’s described these communities as a “security threat” to the settlers. Al Hadidya is located just next to Ro’i, which was partially built on their land, and inhabitants have to more or less drive through the the outskirts of the settlement in order to reach their home. Any company trading from Ro’i, or importing their produce, are directly responsible for the very real possibility of Al Hadidya’s forced extinction. 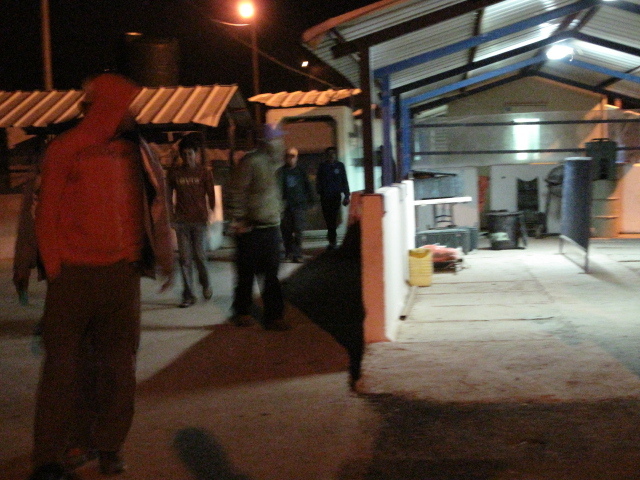 Almost every morning, between 3 and 4am, hundreds of workers from outside the Jordan Valley, from towns as far away as Nablus and even Jenin, queue at Al Hamra checkpoint, sometimes for hours, to get to work at the Israeli settlements in the valley. Often workers arrive too early, for fear of losing their job if the delays are bad, and sleep in the fields on the other side of the checkpoint. Palestinian workers on Israeli settlements are routinely paid below minimum wage. The settler bosses are seldom seen before the more civilised time of 9am. 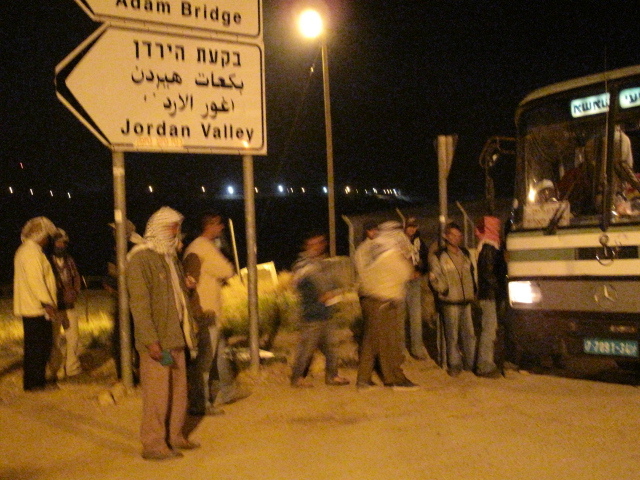 Workers often encounter repression at Al Hamra checkpoint. Corporate Watch has heard reports and witnessed Palestinians being bodysearched, stripsearched or forced to wear blindfold while soldiers check IDs. 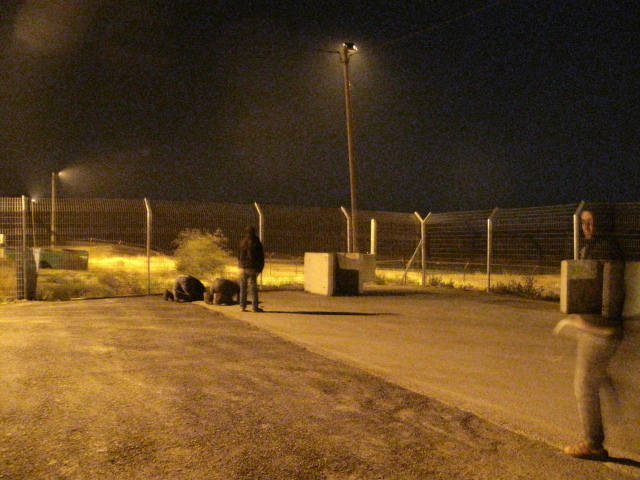 Travellers are often subjected to insults and abuse by soldiers at Al Hamra. Tomer is an illegal Israeli settlement of nearly 300 people close to the Palestinian community of Fasayil. It employs Palestinian and Thai workers, the bosses are Israeli. Tomer was established in 1976 on the lands of the people of Fasayil, Al Auja and other nearby Palestinian communities. 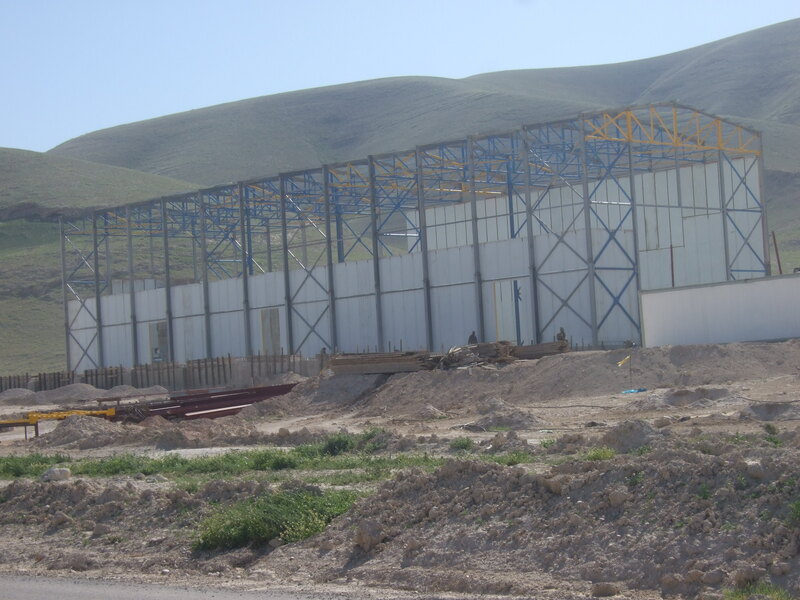 TBP Export – http://www.tbp-export.com – Have a packing house in Tomer. They are, according to their website, an international marketing company for fresh produce set up by two Israeli agricultural companies, Mor-Li and Bar-Mor. Despite basing its packing house on an illegal settlement TBP export boasts that it is certified by EUREPGAP, an international certifier of “good agricultural practice”. They are also approved to British Retail Consortium (BRC) standards, suggesting they are marketing their goods in Britain. The company advertise potatoes, sweet potatoes, strawberries, peppers, herbs and organic products. TBP list many locations where they source their produce, although not the Jordan Valley. TBP does list Beit Shean and the Arava as two of their growing areas, the areas directly North and South of the valley. 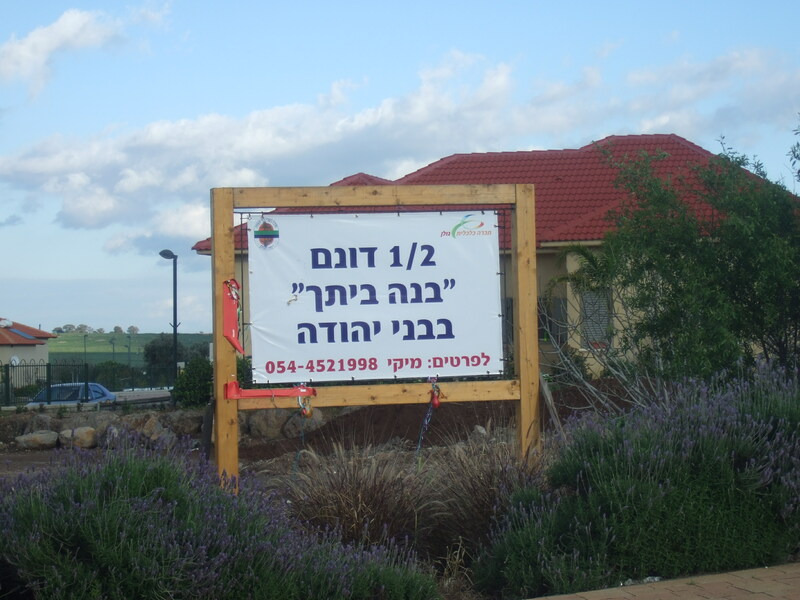 TBP’s contact address is in Ein Vered near Israel’s South Coast. 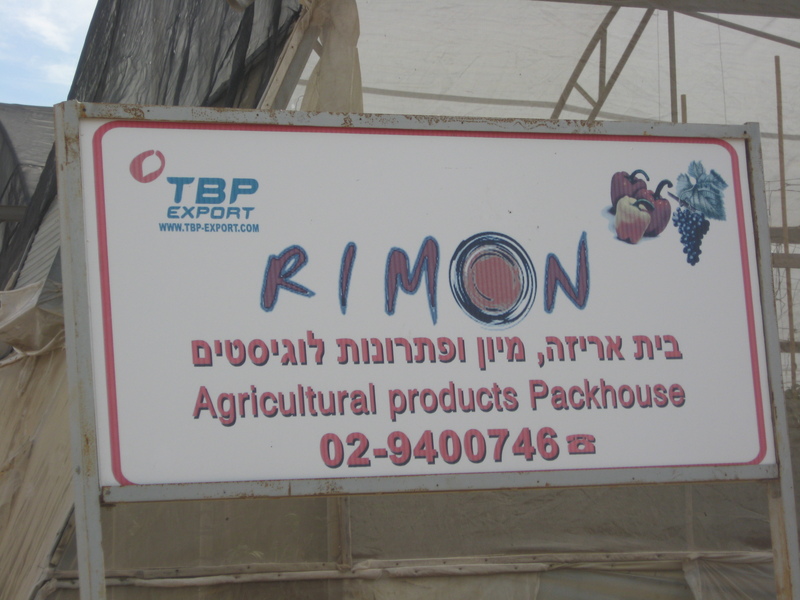 TBP use the brandname ‘Rimon’, Corporate Watchers saw a truck emblazoned with this logo picking up produce from Tomer. 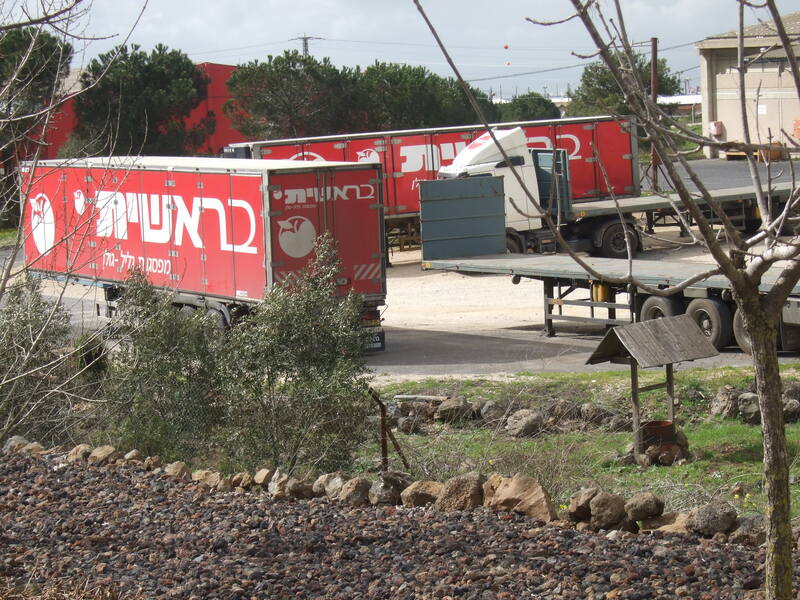 Carmel Agrexco – http://www.agrexco.co.il – Agrexco has several packing houses in Tomer and several Agrexco vans could be seen visiting the settlement every day. 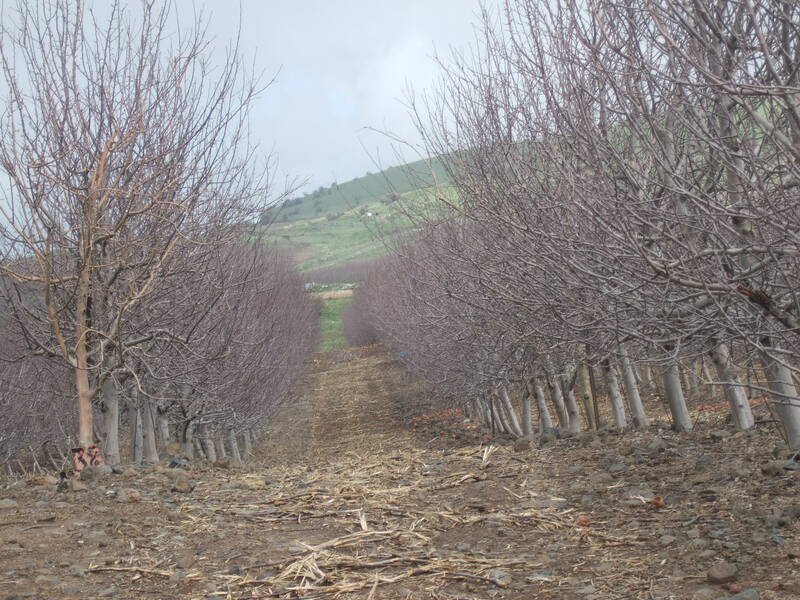 Agrexco are the largest agricultural company operating in the Jordan Valley and use the brandnames Carmel, Jaffa, Biotop, Coral, Jordan Plains, Alesia and Ecofresh. Agrexco subsidiaries include Agrexco (France), Agrexco (US), Carmexco (Italy), Eclectic, Carmel Cor, LACHS, Dalia (Germany). 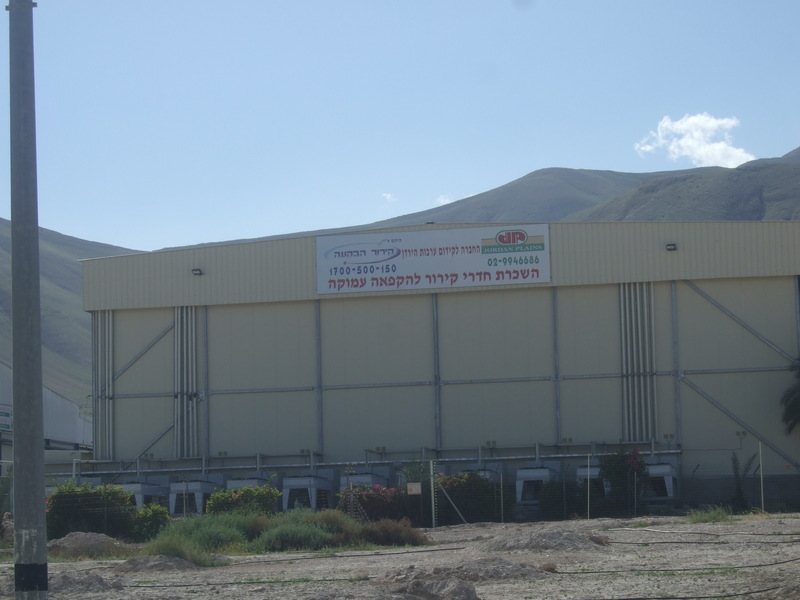 Agrexco have a regional office in the occupied Jordan Valley, at the Arovot HaYarden Regional Council, and are building a new refrigeration centre there. 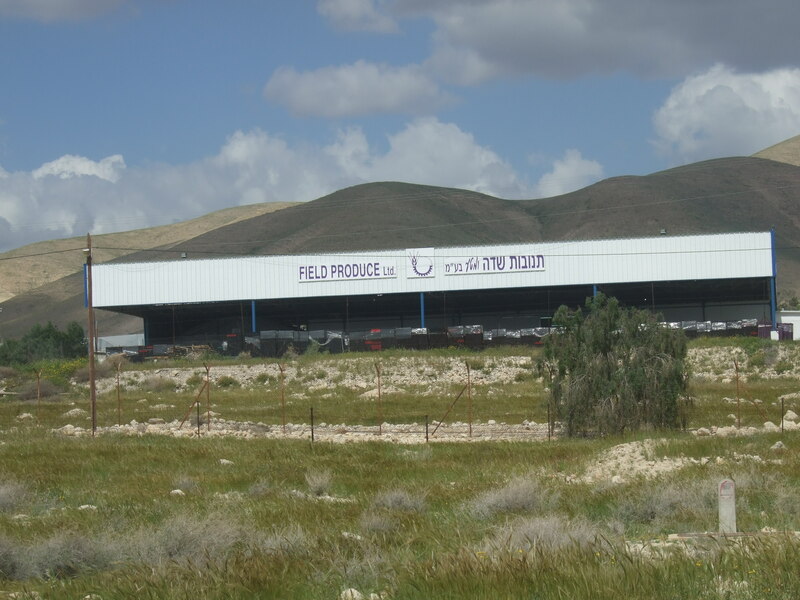 The company operates packing houses in most of the Jordan Valley settlements including Netiv Hagdud, Ro’i, Argaman, Mehola and Bet HaArava . There has been a long running direct action campaign against Carmel Agreco in the UK (See http://www.indymedia.org.uk/en/actions/2008/carmelagrexco/). Activists have repeatedly shut down Agrexco’s depot in Hayes, Middlesex, with blockades and occuptions. In 2006 a case against campaigners who had blockaded the company’s premises was dropped after the defendants had obtained disclosure from the company of its business in the occupied territories. 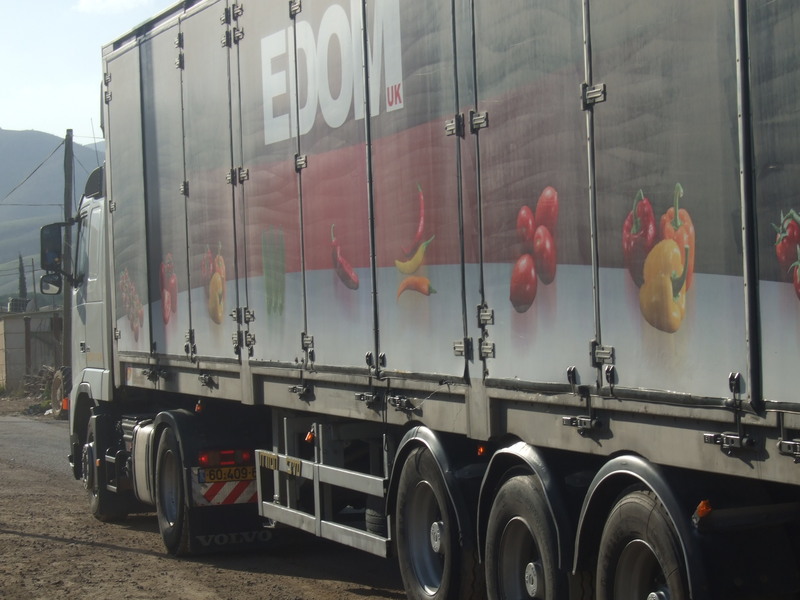 The managing director, Amos Orr, stated in court that 60-70% of all produce from the West Bank was exported through Agrexco. Carmel’s site boasts that they have branches in London, Frankfurt, Paris, Rotterdam, New York, Zurich, Vienna, Madrid and Milan. 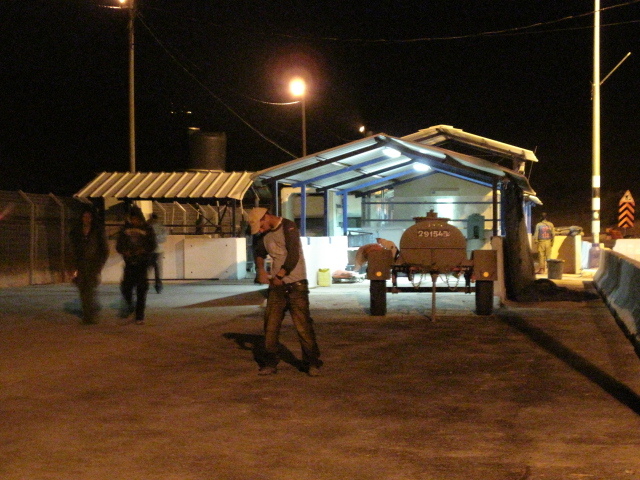 Several interviews with Carmel workers in the Jordan Valley by Corporate Watch and the Brighton-Tubas Friendship and Solidarity Group (www.brightonpalestine.org) have found that workers picking fruit and vegetables for the company in the occupied Jordan Valley are paid 70 – 75 shekels (about 13 pounds), less than half the Israeli minimum wage. Nirav – http://www.nirav.co.il – Marketing company for greenhouses, sheds etc. 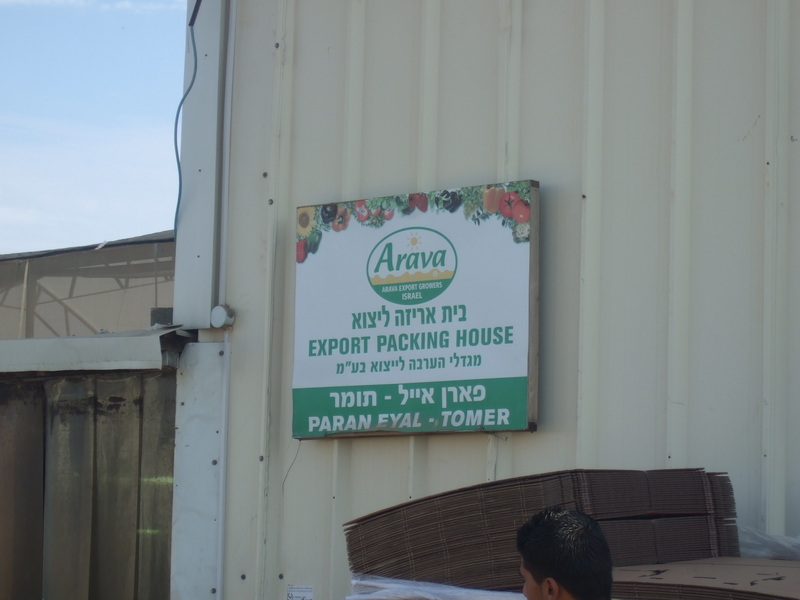 Arava – http://www.arv.co.il – Arava Export Growers is the third largest agricultural export company in Israel, with export sales of about € 60 million. 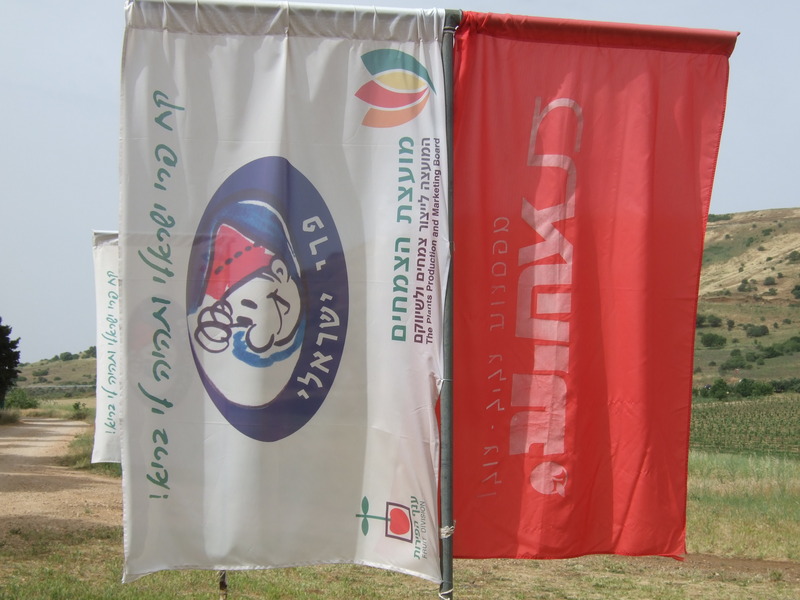 It is 50% owned by B. Gaon Holdings and 50% by farmers in the Arava region of Israel. Arava advertise that their products comply to organic EUREGAP and British Retail Consortium Standards, suggesting a focus on exports to Europe. Arava have a sales office in the UK run by Mill Associates. Arava have subsidiaries in the US and Holland with head offices in New York and Bleiswijk respectively. 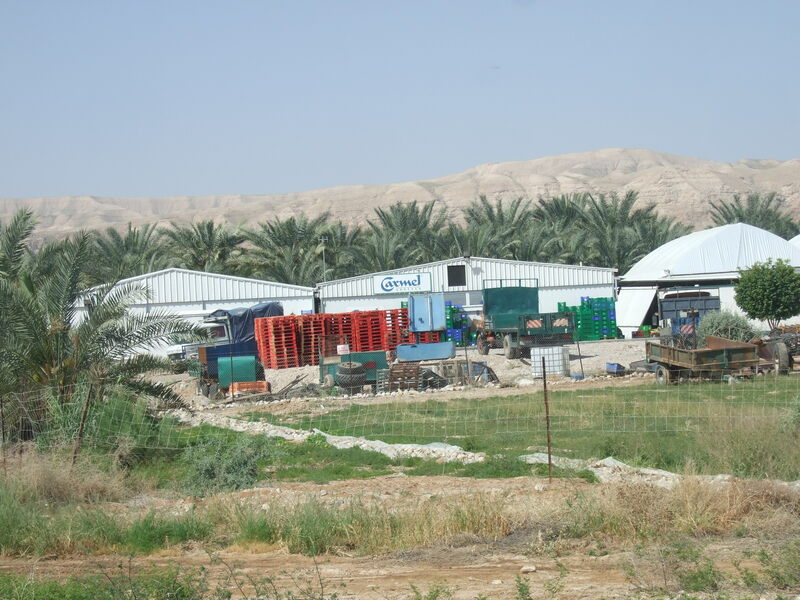 Last week Corporate Watch revisited the building site for a new packing house on the land of the Arovot HaYarden Regional Council close to Massua settlement in the occupied Jordan Valley. Workers at the site confirmed that the building will be a new date refrigeration house for Jordan Plains. Jordan Plains is a company exporting through Carmel Agrexco. 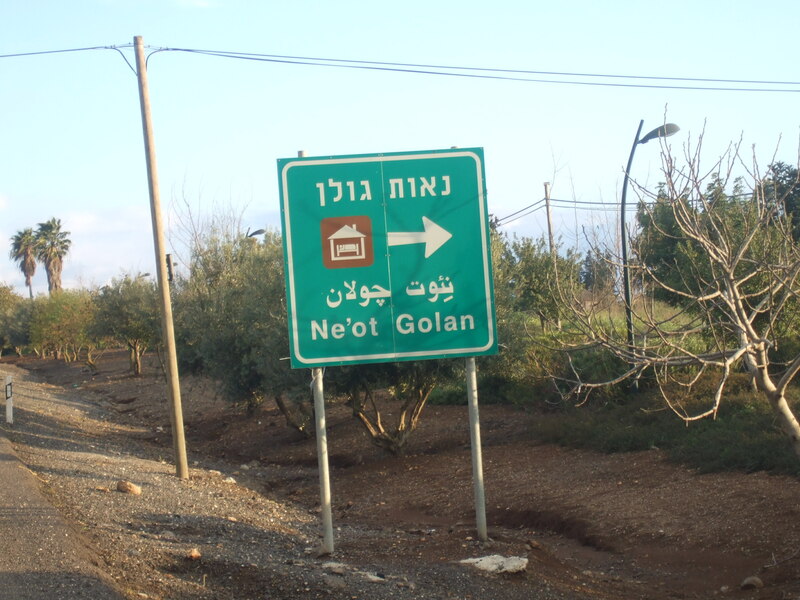 The illegal settlement of Ne’ot Golan was established in 1967 after Israel’s occupation of the Golan Heights. It was established on the land of the Syrian city of Fiq. The above picture is of the apple packing house beonging to the settlement. 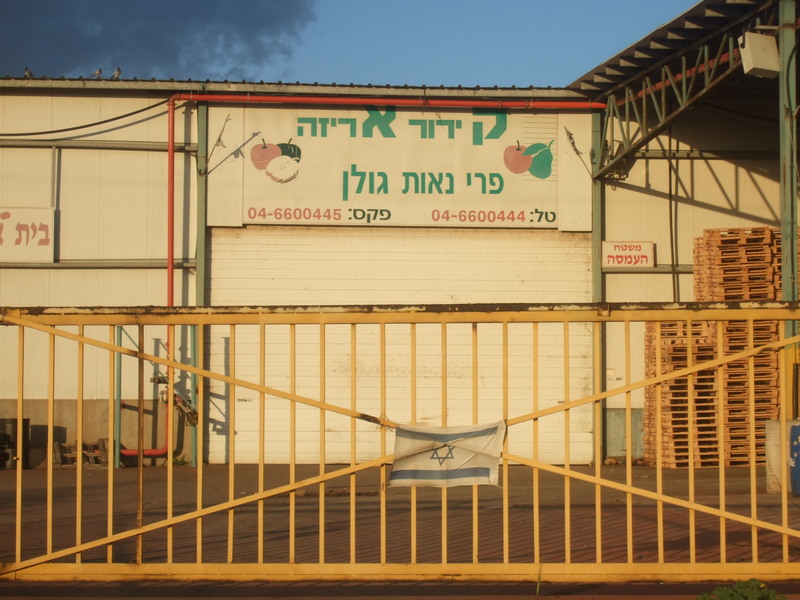 Apples from Israeli settlements in the Golan are exported internationally. Agrexco Agricultural Export Company Ltd. markets most of Israel’s exports of fresh fruit, vegetables and flowers, some of which are grown in illegal Israeli settlements in the West Bank. 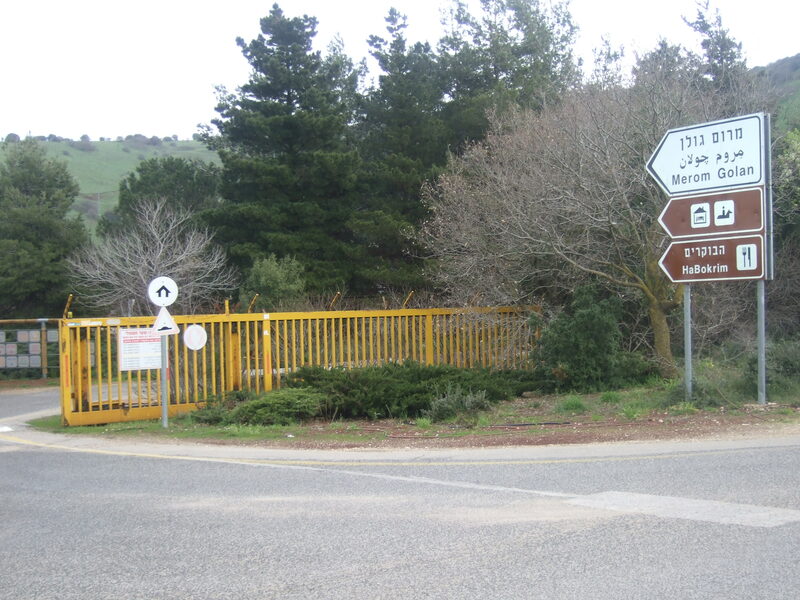 In a court case in November of 2004, the General Manager of Agrexco UK at that time, Amos Orr, testified that Agrexco markets 60-70% of the agricultural produce grown in Israeli settlements in the occupied territories. Agrexco is worth half a billion Shekels (nearly £78m) and employs about 500 people. 50% of the company’s shares are owned by the Israeli government, although a ministerial committee last year decided to privatise it . Agrexco’s biggest fresh agricultural produce brand is Carmel. 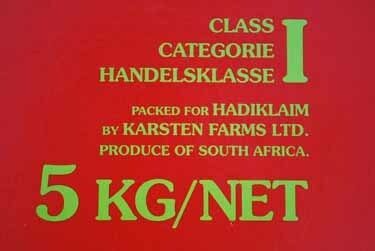 Other brand names include Jaffa and Jordan Plains. The company’s subsidiaries include Agrexco (France), Agrexco (US), Carmexco (Italy), Eclectic, Carmel Cor, LACHS and Dalia (Germany). For more information on Agrexco, see http://www.bigcampaign.org/index.php?page=who_exports_israeli_goods. As Palestine solidarity campaigners continue to hold protests and take direct action against Israeli exporter Carmel-Agrexco, the Israeli government tries to ‘confuse’ the boycott campaign against the company by allowing it to export flowers grown in Gaza in a Valentine-special PR exercise. According to Agrexco, the Gazan flowers will be sold with the label “Product of Gaza Strip”. However, it is often harder to detect the source of flowers than of fruit, vegetables and herbs. 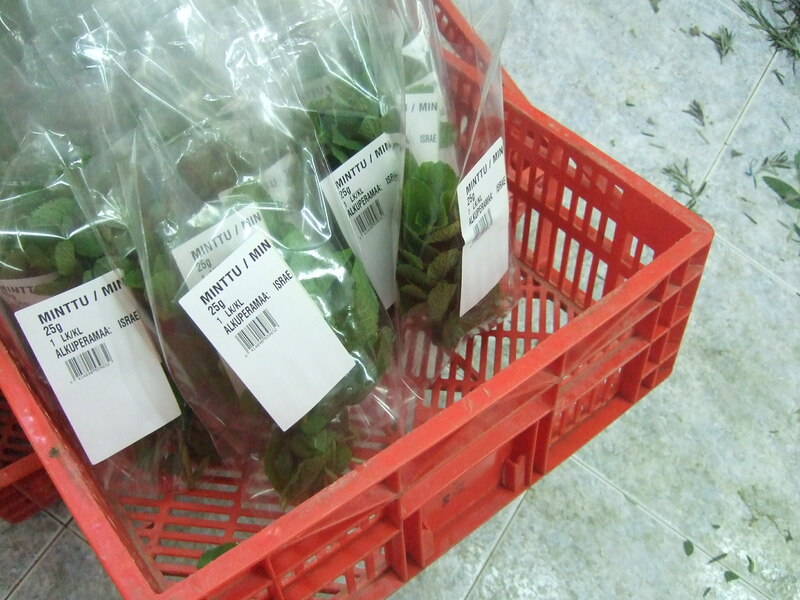 Many Agrexco flowers grown in Israel or the Occupied Territories are sold on or packed in Holland and labelled accordingly. 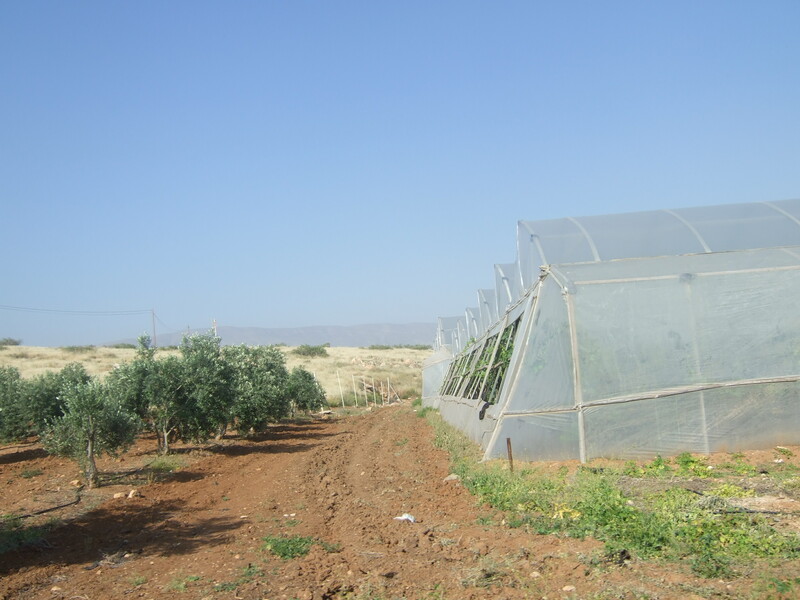 It is widely known now that some of the ‘Israeli’ fresh produce exported through Agrexco is grown in illegal Israeli settlements in the Palestinian Occupied Territories. In a court case in November 2004, the general manager of Agrexco UK at that time, Amos Orr, testified that his company markets 60 to 70 percent of the agricultural produce grown in Israeli settlements in the Occupied Territories. 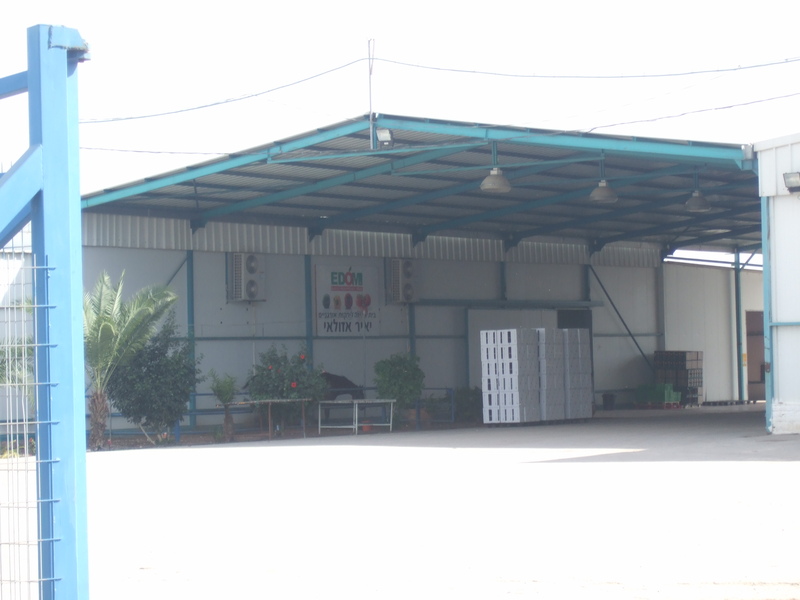 Agrexco Agricultural Export Company Ltd. markets most of Israel’s exports of fresh fruit, vegetables and flowers. 50 percent of the company’s shares are owned by the Israeli government and 25 percent by an Israeli settlers cooperative called Tnuva, although a ministerial committee last year decided to privatise it (see here). The company is worth half a billion Israeli Shekels (approximately £78m) and employs about 500 people. Agrexco’s biggest fresh produce brand is Carmel. Other brand names include Jaffa, Coral and Jordan Plains. The company’s subsidiaries include Agrexco (France), Agrexco (US), Carmexco (Italy), Eclectic, Carmel Cor, LACHS and Dalia (Germany). For more information on Agrexco, see here. Under the slogan “Don’t flirt with Israeli Apartheid – Boycott Israeli goods”, the Boycott Israeli Goods campaign (BIG) and the Palestine Solidarity Campaign (PSC) called for a ‘mass picket’ at the Agrexco depot in Hayes, Middlesex, on 7th February, as part of an international week of action against Agrexco. About 70 protesters gathered at the warehouse, surrounded by a massive number of cops, who blockaded the depot since early morning. On 12th Feb, a group of 15 women locked themselves to the gates of Carmel-Agrexco’s depot to stop the delivery of Valentines roses. They were met with heavy force from security and police. Emma Goldman, a member of the London Anarchafeminist Kollective, said: “This Valentine’s Day, women in Palestine will be struggling to piece their society together against the brute force of the occupation. Carmel-Agrexco, a state-owned company, is at the heart of Israel’s colonisation and exploitation of Palestinian land.” On 23th February, a small protest was held at the London headquarters of Apax Partners, a UK-based private equity giant that holds a majority stake in Israeli agricultural co-op Tnuva, which owns 25 percent of Agrexco Agricultural Export Company. Earlier in the morning, an anonymous protester had D-locked the building’s main door, causing some disruption to the baffled employees arriving to work (see here). The campaign against Carmel-Agrexco in the UK has been growing ever since seven activists blockaded the company’s depot in Hayes in November 2004 for over 11 hours, using metal fencing. The ensuing prosecution of the blockaders failed after campaigners argued that Agrexco was ancillary to Israeli war crimes under the International Criminal Court Act 2001. In September 2005, a Judge ruled that Agrexco (UK) must prove that their business was lawful. Charged with proving that the lawfulness of their business, Carmel-Agrexco withdrew their case. The acquittal of the seven activists before they were able to present their defence, however, meant that the court did not have to rule on the legality of Agrexco-Carmel’s involvement in the supply of produce from illegal settlements in the occupied West Bank and Gaza Strip. Since then, dozens of blockades have occurred each year; Carmel’s offices have been subject to extensive damage by protesters; and their depot occupied. Yet, the company has not been willing to take prosecutions against campaigners for fear of having their business practices exposed and questioned in court. For more on the actions against Carmel Agrexco in the UK over the years, see Indymedia UK’s special topic page. VisionOnTV and Corporate Watch host a video feed of grassroots films about resistance to corporate power. Every month we will showcase one of these films. All films are collected at http://corporatewatch.visionon.tv. This month we have chosen Boycott Carmel-Agrexco, a short film about the campaign against Carmel-Agrexco. Carmel-Agrexco is an Israeli agricultural export company importing fresh produce into the UK from Israel and Israeli settlements in the West Bank (see http://www.corporatewatch.org/?lid=3192). The film features interviews with Palestinians working for Carmel-Agrexco and direct actions against the company in the UK. Watch the film here.